Charles (Charlie) Kahn, Jr. and his wife, Barbara, have long supported and advocated for a wide variety of Einstein and MossRehab programs. Nowhere is their touch more evident or had a greater impact than at MossRehab’s Aphasia Center. The Kahns have always had a great affinity toward Einstein and MossRehab. 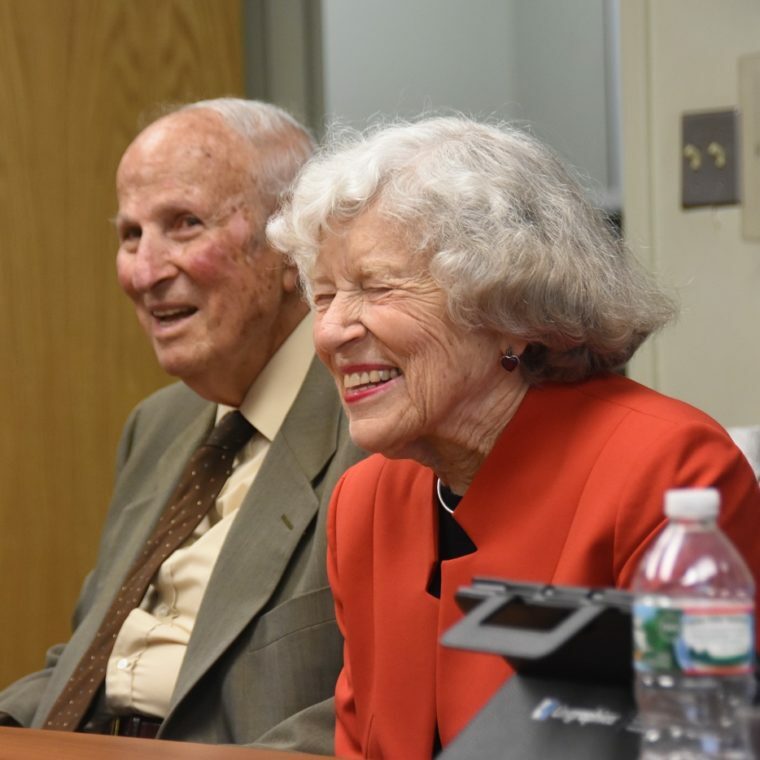 One might say it is a “family tradition” as Kahn followed in the footsteps of his father, Charles Kahn, Sr., who served on the board of the Jewish Hospital, on which Einstein Healthcare Network was founded. Kahn, Jr. went on to serve on the board of the Lucien Moss Home for Tuberculosis Incurables of the Jewish Faith, the predecessor of MossRehab, and continued his active support throughout the years helping to shape MossRehab as it now exists. Over the years the Kahns became close to many patients and staff at MossRehab, particularly at the Aphasia Center. “We are so impressed with the staff at the Aphasia Center and their efforts to help the patients,” says Charlie. “Patients are experiencing real breakthroughs due to groundbreaking treatments. The results are inspiring." Aphasia is a condition brought on by trauma impacting the left side of the brain. Caused by stroke, brain tumors, traumatic brain injury or disease, aphasia impacts an individual’s ability to communicate through spoken and written language. The MossRehab Aphasia Center, founded in 1996, was developed to meet the long-term communication and psycho-social needs of these individuals. The center was designed to be a warm, welcoming place where people can find information and peer support, as well as participate in various groups and classes, research and advanced clinical treatments. The Aphasia Activity Center provides post-therapy services and helps to solve discharge issues, by providing a continuum of care and lifelong learning opportunities, using a social model of rehabilitation. Since aphasia affects the ability to communicate through speech and the written word, rehabilitation in a social setting enables participants to practice communicating through supported conversation activities. Programs like the Constance Sheerr Kittner Conversation Cafés, the Talking Book Club and Computer Lab are some of the activities used to facilitate and support conversation and are making a significant difference in the quality of life for those with aphasia. As Fink explains, “These programs can help improve the quality of life by reducing social isolation, one of the unfortunate results people with aphasia can experience.” The Kahn Scholarship Fund provides opportunities for participation in activities which promote language improvement. The MossRehab Aphasia Center was among the first in the country to offer life-long learning and social interactions for people with aphasia. Many of these services are made possible due to the support of generous donors, like the Kahns, who are inspired by the efforts of the staff to make a real change in the lives of others. Visit the Aphasia Center at MossRehab’s Site here. To learn more about how you can support the Aphasia Center at MossRehab, please contact Nikki Benson-Watlington at 215-663-6344 or BensonWN@einstein.edu.